In the 1830's Hanley was considered 'a large modern town', the largest in the Potteries and the second in Staffordshire; its streets 'generally spacious and well paved', its houses of 'neat appearance, and some of them, as well as the public edifices . . . spacious and elegant'. On the other hand much of the town was overcrowded and insanitary. In 1850 it was noted that 'the principal streets have some good shops; and there has been lately finished a range of shops far above the standard of everything else in the Pottery district'. In the first third of the 19th century the ground plan of the present town-centre, including the area round Piccadilly and Pall Mall (in Shelton Township), was completed. 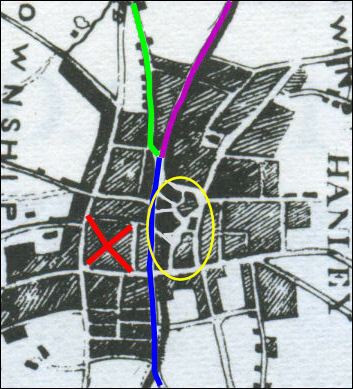 The streets in the rectangle formed by Albion Street, Lichfield Street, Mollart Street (then Union Street), and Bethesda Street on the south side of the town, much of the area around Hope, Hanover, and Union Streets on the north side, and many of the streets on the eastern slope above the town had been laid out. Charles Street and Well Street represented the beginning of development in the Wellington area to the south-east. Blue line is Stafford Street. Purple line is Bryan Street. Green Line is Hope Street. The yellow oval locates the main squares and open areas. 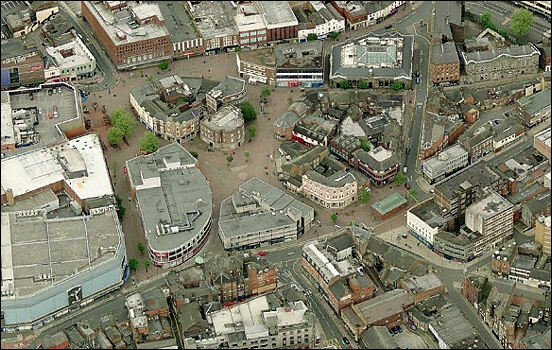 Everything to the left of Stafford Street was in Shelton and to the right in Hanley. The centre of Hanley preserves the irregular layout of the late-18th-century village and in 1960 Mr. J. W. Plant the City Reconstruction Officer described it as 'an archipelago of island sites'. The buildings occupying these variously shaped islands have been replaced piecemeal from the early 19th century onwards and are now of widely different heights, styles, and materials. Because of Hanley's development as an important shopping centre and the large scale of its later commercial buildings this lack of uniformity is even more pronounced than in the other Pottery towns. A few low-built brick houses dating from the first third of the 19th century have survived, notably in New Hall Street, Parliament Row, and Tontine Street. On the south side of Fountain Square the French Horn public house and the single-story shops adjoining it are of this type. 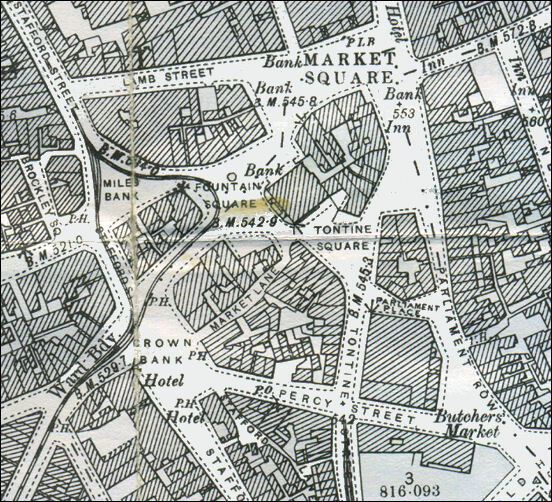 These 'island sites' consisted of Market Square (and Upper Market Square), Fountain Square, Tontine Square, Miles Bank and Crown Bank - these areas all ran into one another and occupied the area between Market Street (current Parliament Row) at the top and Stafford Street at the bottom.